Spearheaded by Montecito Trails Foundation, the LPFA Trail Crew along with SBMTV, SBCTC and the Multi-Use Trails Coalition have been working on some of the trails above Montecito including Romero, McMenemy, Girard, Cold Spring and Buena Vista. Most of the Thomas Fire trail work in Santa Barbara is being focused on the lower portions of the mountain mainly below the Edison Roads. People are using and enjoying most of the trails but there is still substantial damage to upper Franklin and San Ysidro trails. Lower Cold Spring and West Fork Cold Spring remain closed. Check back regularly for updates on progress being made to restore damaged trails. Out of the Thomas Fire ashes has risen a coalition of Ventura County and Santa Barbara based non-profits who are working together to restore the miles of trail damaged by the Thomas Fire. 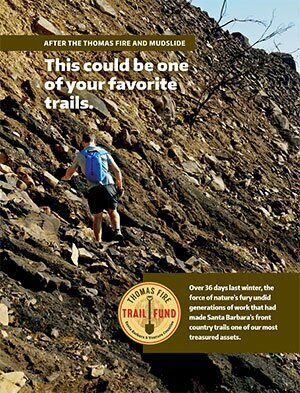 With the support of local government agencies and the Forest Service, they have created a Thomas Fire Trail Fund in the hopes of raising $1,000,000 for the damaged trails. If you’re here, it’s probably because you too have a passion for being outdoors and enjoying the places our trails allow you to explore. Together, we can make our trails better than ever. Let’s join forces!